This 12-month long, one-of-a-kind fishing tournament is geared to provide both tourists and locals alike a way to take their fishing adventures to the next level. Tagging sharks adds to the excitement of fishing in addition to providing much needed research. It is well known that in many areas of the world sharks are overfished and in trouble. However many people don’t realize there are many species here locally that are edible, sustainable and shark numbers are skyrocketing. We have created an exciting event to shine a light on fishing’s ultimate species. Our new shark tagging trips are designed to engage all levels of anglers. Shark Tagging is perfect for family’s visiting our area or locals that love to fish. This is great fun for everyone to catch and tag sharks while providing the added excitement of a tournament with great prizes all year! Sea Leveler & Time & Tide boats are located behind Grills Seafood Decks and Tiki Bar in Port Canaveral FL. They offer trips daily and nightly! All Water Shark Derby is excited to work with these 2 charter companies because of their excellent reputation, commitment to customer service and passion they have for fishing. We are blessed to live on the Space Coast and love it’s laid back culture and nature loving locals. We are currently the 2nd largest cruise ship hub in the world and this has helped us stay true to our passion for sharing our area with others. We are in the perfect area and position to teach thousands of anglers, no matter their experience level, that conservation is rewarding and fun! Why do we tag sharks? The shark tagging program has a rich history. Between 1962-2013, over 243,000 sharks of 52 species have been tagged. From this group, more than 14,000 sharks of 33 species have been recaptured. The longest time at liberty for any shark in the program is 27.8 years (sandbar shark). Data from tagging programs provide valuable information on many aspects of shark biology and habits. The need for international cooperation in such work is underscored by the fact that many shark species have wide ranging distributions, frequently traverse national boundaries, and are exploited by multinational fisheries. The shark tagging program is also an important tool used to increase our biological understanding of sharks and to obtain information for rational resource management. The tagging of sharks provides information on stock identity, movements and migration, abundance, age and growth, mortality, and behavior. Follow us for updates, prizes and special offers. This year starting July 4th 2017, we will be offering up monthly and yearly awards, cash and prizes to anglers that fish with us in the AWA Shark Tagging Derby. Each month we will hold a random drawing from the shark tag numbers. We will announce the winners on our social media networks and in our monthly newsletter. A $50.00 Entry fee gets you in the Derby! We have the kits ready to go right now and we encourage everyone to participate. The awesome thing is that every shark you tag gets you entered in a year long drawing for awesome prizes from our sponsors. Several tag numbers will be drawn live each month and if your number is drawn you win. Grand prizes will be drawn on July 3rd 2018. Even if you win a previous prize your tag number stays active to give you a chance at winning every month. You also get to name your shark and dedicate it if you would like! In addition you will be notified if your shark is recaptured. Catch, Tag and Release a shark over 10 feet on one of our AWA Derby Shark Charters and your tag number goes in the drawing for the year’s end BIG PRIZE. You will also have other special opportunities to win. Catch, Tag and Release a Shark over 8 feet (excluding nurse shark) and your tag number goes in the Heavy Weight Monthly drawing and year’s end for Top Heavy Weight Drawing. 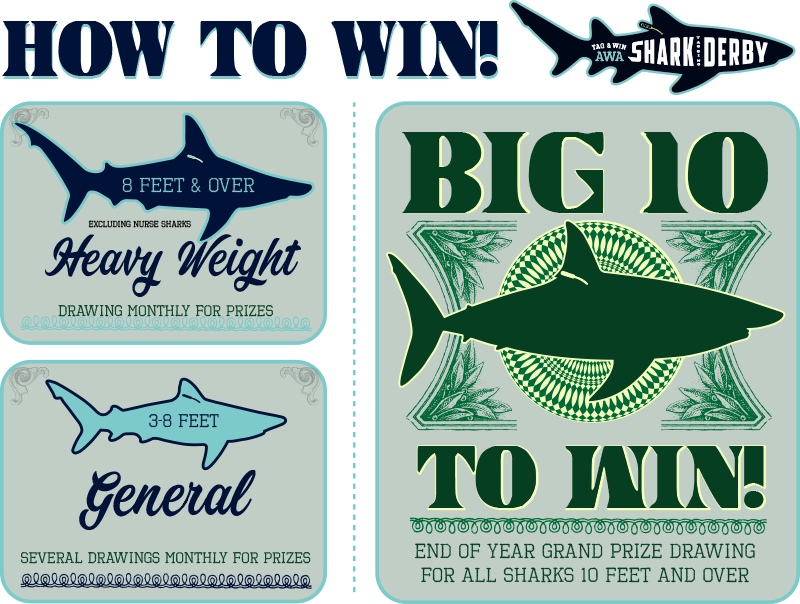 Catch and tag a shark under 8 feet and your tag number goes in for monthly drawings for prizes and Top General prize at the end of the year. General category has several drawings a month and a few surprises too!